How an absorbent is built does have a big impact on its durability This is an area that Spill Solutions Canada specializes in to make sure our products are capable of doing the job required. 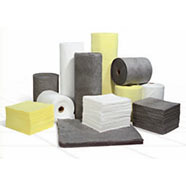 Maintaining the balance between strength, durability, absorbency and performance is the key to manufacturing a product that will always be in high demand. This construction is offered in meltblown only. Made by simply blowing the desired weight in one go, and then putting it into either pad or roll format . Single layer offers fast absorption but limited durability. The marine and spill industries really appreciate this construction type. This product involves sonically attaching a thin layer of ‘no-lint’ spun-bond material onto the top surface of the sorbent. This greatly reduces the linting, (fibres detaching easily) and improves the strength considerably. When used in roll form the product has the large advantage of not being as slippery as double sided lamination sorbents. 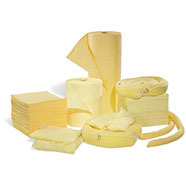 This construction type represents our highest quality and most absorbent pads. It also possesses excellent wicking properties. 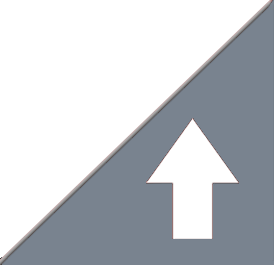 Fine Fibre features less linting when compared to the Sonic Bonded choice, but more durability than when compared to Double Sided Lamination. Another useful attribute is that it isn't slippery when wet. This construction is a clever and simply a smarter solution for most maintenance situations where the sorbent can be placed under the leak. 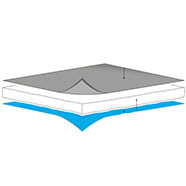 The sorbent will hold the spill but does have a tendency to permeate through to the ground below, this is prevented with the poly-backing layer. 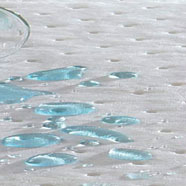 This construction offers a sorbent that has both surfaces covered with a non-linting strong spun-bond cover. This configuration is the best for durability and results in a sorbent, which gives virtually no-linting at all. Caution is recommended however as any foot traffic should be avoided on this product, as it has the potential to be slippery when wet. Spill Solutions Canada Ltd. carries a number of product bale weights that lie in each of these 3 categories, giving our customers the ultimate choice in any weight category!